Whether you live in Dublin and are looking for coach hire to somewhere else in Ireland or the UK, or you’re traveling to Dublin for the scenery, the history, or for the Guinness and the ‘craic’, a visit to Dublin is best appreciated by coach. National Coach Hire will help you make the most of Dublin and, if you’re using it as a base, will help you explore the rest of Ireland too. 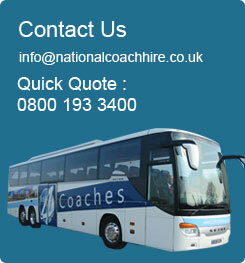 At National Coach Hire we are experts in ‘all things Dublin’, Ireland’s capital city. As one of Europe’s most popular tourist destinations, Dublin is a city confident both of its history, and more recently, after an economic boom, of its future. As such, there is an incredible amount to see and do for the visitor to Dublin. From its historic monuments to its tours highlighting the city’s literary heritage (from Yeats, Shaw, Wilde and Swift to Dublin’s favoured and famous son, James Joyce) to its artistic scene taking in the Book of Kells and the incredible collection of Sir Alfred Chester Beatty; from the National Gallery (which includes works as diverse as Caravaggio and Jack Yeats; to the Hugh Lane Gallery with its impressive Impressionist collection and the complete studio of Francis Bacon. With a number of other small and modern galleries dotted all over the city, National Coach Hire will make sure you don’t miss a thing. Equally, if it’s history you’re after, we’ll take you all over Dublin, from the Aras An Uachtarain, the home of the Irish President; to Dublin Castle, to the famous General Post Office, scene of the 1916 uprising. Or why not try one of the hundreds of museums, from The National Museum to the oddities and Victoriana of the Natural History Museum? If you’ve come to Ireland for religion, you won’t be disappointed, with churches on every other corner – in Dublin there are the pick of the bunch, from Christ Church Cathedral to the hallowed ground of St Patrick’s Cathedral. And when you’re tired of all that culture and history why not have a pint or three of the famous dark stuff and let us take care of the driving? Should you wish to venture further afield, perhaps using Dublin as a base to see more of Ireland, then coach hire really is the best, and most flexible option. On the outskirts of Dublin there are Phoenix Park, Europe’s largest city, the National Botanic Gardens, Marino Casino and Dublin Bay (best seen from Killiney or Dalkey Villages). Further out are the gently undulating hills and beautiful farmland of south east Ireland, with its villages and castles, its seaside resorts and stunning gardens. Should you wish to make day trips to Monasterevin or Kildaire, Castletown House or the incredible gardens of Powerscourt, coach hire is the only way to see this breathtaking countryside. National Coach Hire will show you the very best of Dublin and Ireland safely and in style, allowing you to soak in the atmosphere of this wonderful country.